The above info came from I've commented. and Akira Kanbara, and was edited by yours truly (contact me). 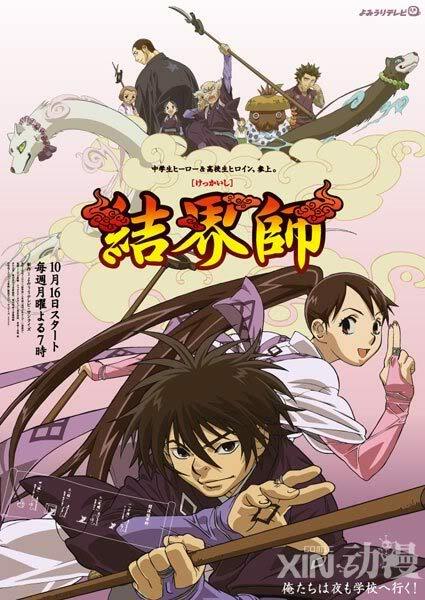 Kekkaishi follows 14 year old Yoshimori Sumimura and 16 year old Tokine Yukimura, heirs to rival clans of Kekkai, and their quest to destroy and defend the land of the site of the castle where the first Kekkai Master, Tokimori Hazama, once defended the land from the Ayakashi, or demons spirits. The land draws the Ayakashi to the spot where Yoshimori and Tokine must fight and capture theses spirits using the Hazama-ryu kekkai technique. Hoi used to lock onto the Ayakashi. Joso is used to hold it to where it's at. Ketsu is used to create the kekkai or barrier around the spirit. Kai is used to dispel the kekkai without damage to the target. Metsu destroys whats inside the barrier. Tenketsu opens a door to the other world and sends the spirit through to make sure it doesnt regenerate and come back. Zekkai allows the user to reflect an attack or harm an enemy. Musou is a state of mind that lets the user not be influenced by any force it increases speed power and efectiveness of the kekkai. Shinkai creates a new world and consumes more energy than Zekkai and is said by Tokimori that is is close to the power of Go. Shuufuku is used to repair an abject. Skikigami is a power that uses paper dolls and other forms of inanimate objects. The Karasumori Site has mystical properties that attract ayakashi. The ayakashi usually appear at night, so the battles at Karasumori usually happen at night. As stated previously, the two main families in Kekkaishi are the Sumimura family and the Yukimura family, and even though the families are rivals, Yoshimori and Tokine are good-friends and want to end the rivalry between their families. At first it's just Yoshimori, the legitemate heir of the Sumimura family, and his white ghost-dog, Madarao, and Tokine, the legitemate heir of the Yukimura family, and her black ghost-dog, Hakubi. Eventually, Gen, a half-human/half-ayakashi, joins Yoshimori and Tokine and their ghost-dogs at Karasumori. Also, throughout the series, we learn about The Shadow Organization and The Night Troops. Later in the series, The Kokuboro, the main villain group, storm Karasumori, and there is a fight between Team Kekkaishi and The Kokuboro. During the fight, Gen manages to kill a member of The Kokuboro. After the fight, Gen dies from a combination of battle-damage and battle-strain. Team Kekkaishi eventually makes it to The Black Pampas Grass (the Kokuboro's castle), and the final battle begins. The above description came from Akira Kanbara and I've commented., and was edited by yours truly (contact me).